The Wine Advocate - The 2010 Bourgogne is classy, energetic and beautifully focused. A ripe, almost exotic bouquet leads to blackberries, blueberries, licorice and tar. The Bourgogne is plump, juicy and flat-out delicious, especially for a wine at this level. I loved it. Anticipated maturity: 2013-2020. 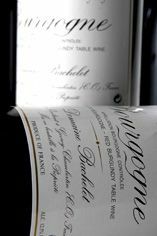 This minute Burgundy wine estate, now reaching just 4ha in size of vineyards in Gevrey-Chambertin, has been run almost single-handedly by the magical Denis Bachelet since 1983. His ability for making pure, graceful wines seems to be entirely natural and he exploits this gift to the full. Denis was born in 1963 in the town of Spy in Belgium – his father had fallen in love with a local girl when he came to visit Spy on an outing with the Gevrey Chambertin choir! Denis would visit his grandparents in Gevrey in the school holidays and came to love the magic of the vigneron’s world. He became fully involved in winemaking from 1981, shortly after his grandfather’s death: whether fortuitously or not the Bachelet wines were outstanding in ’81, an otherwise damp and difficult vintage, and the Charmes Chambertin remained a joy to drink over the following fifteen years. 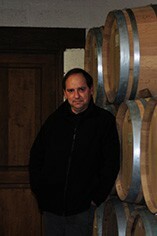 “La finesse avant tout” – finesse before all things – is Denis Bachelet’s watchword and this shows in every wine he makes. There is more attention paid to yields in the vineyard, a better selection of barrels in the cellar (about one third new oak for the Gevrey Chambertin and 50% for the crus), and a feeling of a man in control of his wines and winery. Denis of course believes that the quality of the wine comes from his work in the vineyard, which now includes green harvesting whenever a patch of vines threatens to set too heavy a crop. At harvest time the grapes are sorted in the vineyard to remove anything rotten or otherwise dubious, and from 2003 a further triage has been carried out on a new vibrating sorting table. The grapes are 100% destemmed, then crushed which Denis prefers for colour extraction. After a cool pre-fermentation maceration for up to a week, the vats get to work fermenting the juice with natural yeasts fermentation. As soon as fermentation has finished the contents of the vats are pressed off and left to settle in tank for a week before putting in barrel. Simple but sensible winemaking, amended according to intuition if need be. Bourgogne Rouge is the term used to apply to red wines from Burgundy that fall under the generic Bourgogne AOC, which can be produced by over 350 individual villages across the region. As with Bourgogne Blanc and Bourgogne Rosé, this is a very general appellation and thus is hard to pinpoint any specific characteristics of the wine as a whole, due to the huge variety of wines produced. Around 4,600 acres of land across Burgundy are used to produce Bourgogne Rouge, which is around twice as much as is dedicated towards the production of generic whites. Pinot Noir is the primary grape used in Bourgogne Rouge production, although Chardonnay, Pinot Blanc, Pinot Gris and in Yonne, César grapes are all also permitted to make up the rest of the wine. These wines tend to be focused and acidic, with the fruit less cloying than in some New World wines also made from Pinot Noir, and they develop more floral notes as they age. Although an entry-level wine, some Bourgogne Rouges can be exquisite depending on the area and producer, and yet at a very affordable price.